If there were a cake that embodied springtime, the Natural Strawberry Cake with Browned Butter Frosting would be it: pretty (in pink) and perfect for any special occasion or just a day when you need a little something sweet. In our version, you’ll find chunks of fresh strawberries nestled among fluffy cake layers slathered in a rich browned butter frosting. You can find even more amazing recipes for baking with strawberries in our March/April Issue! In a medium saucepan, cook 2¼ cups (382.5 grams) sliced strawberries, 3 tablespoons (36 grams) sugar, and 3 tablespoons (45 grams) lemon juice over medium heat until slightly thickened, 5 to 7 minutes. Remove from heat, and let cool completely. Preheat oven to 350°F (180°C). Spray (8-inch) round cake pans with baking spray with flour. In the bowl of a stand mixer fitted with the paddle attachment, beat butter and remaining 2¼ cups (450 grams) sugar at medium speed until fluffy, 3 to 4 minutes, stopping to scrape sides of bowl. Add egg whites, one at a time, beating well after each addition. Beat in vanilla. In the work bowl of a food processor, pulse freeze-dried strawberries until powdered, 5 to 6 times. 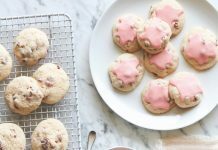 In a medium bowl, whisk together flours, baking powder, salt, and strawberry powder. Gradually add flour mixture to butter mixture alternately with milk, beginning and ending with flour mixture, beating just until combined after each addition. In a small bowl, toss together 1½ cups (255 grams) sliced strawberries and remaining ½ tablespoon (7.5 grams) lemon juice. Stir sliced strawberries and cooled strawberry mixture into batter. Pour batter into prepared pans, smoothing tops if necessary. Bake until a wooden pick inserted in center comes out clean, 25 to 30 minutes. Let cool in pans for 10 minutes. Remove from pans, and let cool completely on wire racks. 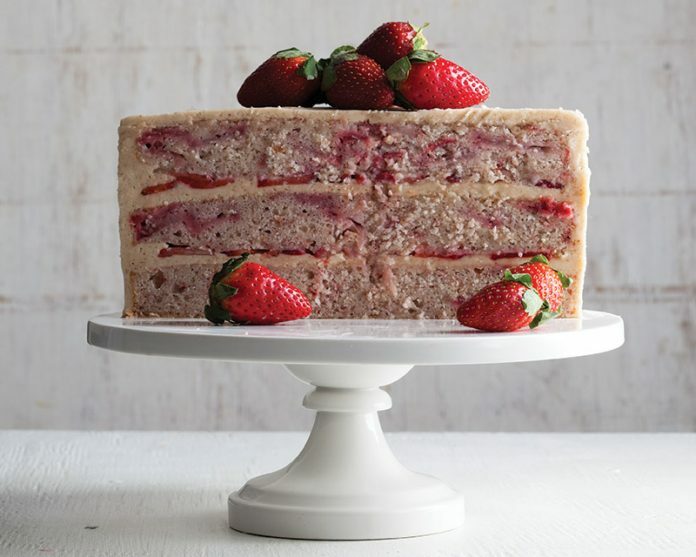 Spread Browned Butter Frosting on 2 cake layers, and top each with ½ cup (85 grams) sliced strawberries. 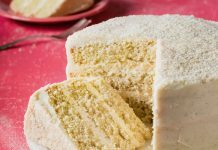 Stack layers, and spread frosting on top and sides of cake. In a medium saucepan, cook butter over medium heat until butter turns a medium-brown color and has a nutty aroma, about 10 minutes. Remove from heat, and let cool completely. In the bowl of a stand mixer fitted with the paddle attachment, beat browned butter at medium-high speed until fluffy, about 2 minutes. Gradually add confectioners’ sugar, milk, vanilla, and salt; beat until well combined, about 2 minutes more. Store frosting in airtight container, and refrigerate for up to 1 week. This recipe says it makes 1 (8 inch round cake). However, reading through the recipe it talks about 3 cakes pans, and the picture shows a 3 layer cake. Please explain? We are only referring to the diameter of the cake being 8 inches. It is an 8-inch layer cake. If we are making a one-layer cake, we try to include that descriptor in the title. We hope this clears up any confusion! Can I make and assemble this cake the night before serving? thank you for reaching out! You can absolutely make and assemble this cake the night before serving! We suggest keeping it in the refrigerator overnight to keep it extra fresh. Happy Baking! Can we use fresh strawberries instead of freeze dried? We have an abundance of fresh berries in our area near New Orleans. Thanks! 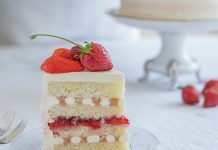 Yes, you can use fresh strawberries for this recipe, but please keep in mind that we developed this cake specifically with the freeze dried strawberries. We cannot guarantee the results if baked with fresh strawberries. Thank you and happy baking!